Just in time for Halloween, researchers have uncovered a new species of millipede that boasts an impressive array of features guaranteed to make you squirm. 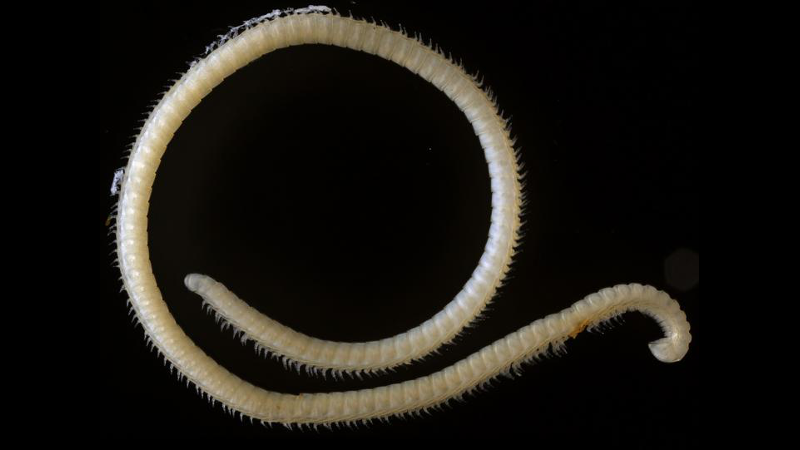 Introducing Illacme tobini, a newly described species of millipede discovered in a dark cave at California’s Sequoia National Park. In addition to its 414 legs, the creepy-crawly insect features 200 poison glands, silk-secreting hairs, and four penises. (Four!) Details of the tiny, thread-like millipede have been published at the open access journal ZooKeys. This new millipede was described by Virgina Tech’s Paul Marek from a lone male specimen, and was found alongside spiders, pseudoscorpions, and flies. The researchers say it’s an ancient species with very limited geographic range. This cave-dwelling creature’s 414 legs may sound impressive, but it’s not a record. That distinction goes to the 750-legged Illacme plenipes, a close relative of I. tobini that was discovered a few years ago in a cave just 150 miles away. Weirdly, I. tobini features four legs that are modified into penises. The ninth and tenth pair of legs along this millipede’s body are used as “copulatory devices” to transfer sperm to the female. Lucky her. In addition to its many legs and multiple penile-like structures, this millipede’s body is covered with long silk-secreting hairs, and paired nozzle-like appendages that squirt a defensive chemical of an unknown nature. Amazing to think that scientists are still discovering entirely new species—and with features that defy explanation.